Why 37 is the New 27? Carlos Explains it All! You are here: Home / Contest / Why is 37 the New 27? Carlos Explains it All! Why is 37 the New 27? Carlos Explains it All! Today John talks to Carlos Irizarry who placed 3rd in our last 12-Week Transformation contest. Read on to find out why “37 is the new 27” for Carlos. How old are you? I am 37 years old. When did you first start working out? If it was before finding Adonis Golden Ratio (AGR) can you briefly explain the types of programs/workouts you did before finding AGR? I started working out at about the age of 16. However, I didn’t take it seriously until I joined the U.S. Army. In the Army, my workouts consisted of cardio, interval/pyramid training, and some strength training but nothing really concrete amounted in order to create an “Adonis-Type” body. While serving in the Army, I did my strength training after work and hit the gym regularly in an effort to build some muscle. Prior to the Adonis Golden Ratio I was on the Somanabolic Weight Training program. Did you follow any sort of diet programs before finding the Adonis Golden Ratio? If so what were they and how did they work for you? I didn’t follow any diet programs, all I did was listen to industry BS about needing to eat 3000 calories/day to build muscle and 1g of protein for every pound of body weight. I listened to that advice and all it did was get me fat. I was looking for answers and could not find it. It was very frustrating. How exactly did you find out about the Adonis Golden Ratio? I actually stumbled upon AGR by mistake. I saw John Barban talking on a video clip with Kyle Leon discussing a bench press technique. At that time I was doing the Somanabolic Weight Training program. I was intrigued when John started to talk about the science part. I had been following the other system but I just wasn’t seeing the results. The eating habits were a bit much and I was not really thrilled with the workout program. I wanted to learn more about AGR so I Googled it and was hooked when John talked about the science aspect of AGR. A lot of things he talked about went against industry BS. So I said what the hell! I jumped into AGR. I decided to enter the contest because I said to myself I think I have what it takes and believed I could compete with the people I had seen win previous contests. So I said I am going to go for it! My expectations for myself were to remain disciplined and push hard to get the body I always wanted. I had conquered the diet portion so it was just a matter of hitting the workouts as outlined. I made the workouts a priority between family, school, and other elements of life. If you want the body that you envision in your mind, then you need to make it a priority. Many people thought I was a freak for telling them I couldn’t eat as much because I was almost at my daily calorie limit or I couldn’t join them at a specific time cause I had to hit the gym. My diet program I used was Any Thing Goes Diet (AGD) at first which was great in learning things about food that you would never consider and how to develop the mindset and overall approach to food itself. Like John said, “a calorie is a calorie”. I used the AGD in the beginning of the transformation and during the end transitioned to the Reverse Taper Diet (RTD) which I really love and I use regularly now. Patience was my big challenge but I had some small challenges which came in the form of adjusting my eating habits. Sticking to the amount of daily calorie intake was challenging but once I got the hang of it, it was not an issue. As my body started to change it was cool to see other people’s reactions. Family and friends began to ask what I was doing, that it looked as if I lost weight or I looked great. Some people could not understand what I was doing and said it would be too hard for them to make the change I made. To keep things simple, I told them I was calorie counting and working out. 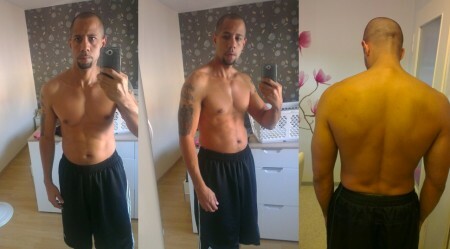 When I Iook at the before and after pictures I am proud at the results of my hard work and discipline. I thought I would never find the answers to a great body. Everyday now I look in the mirror and say “37 is the new 27” because many people now think I am 27 yrs old. I would say to other guys that it is possible to transform your body and create a lasting great look. All you need to do is have the discipline and will to make it happen! Next for me is to continue to work on my body to get it to where I really want it. Don’t get me wrong, I am happy with the look but there is always room for improvement in my book. I want to build more muscle and work on the weak areas of my body. A future goal of mine is to re-enter the transformation contest and attain a physique similar to what Pete Dickison has. Following the mainstream fitness advice does not does not guarantee a physical transformation. The science behind the Adonis Golden Ratio is unmatched. I believed and trusted it was the program I’d been looking for all along. Expect some challenges along the way, remain disciplined, push hard and you are on your way to achieving the body you’ve always wanted. Make your nutrition and training a priority, but also keep in mind the balance between other elements of your life. If your just getting you may want to begin with the Any Thing Goes Diet (AGD) and then transition to the Reverse Taper Diet (RTD). Initially some people maybe resistant to the efforts you’re making to transform your physique. This is normal, stay the course and if people are truly interested in what your doing keep it simple when explaining to them.